Junior wide receiver Jack Cook finished The Game with a team-leading 116 receiving yards on four catches, with this catch serving as the go-ahead touchdown that put Harvard in the lead for good. This weekend, Harvard beat Yale for the first time since 2015. Rather than Harvard Stadium or the Yale Bowl, the 45-27 Crimson win in the 135th rendition of The Game was hosted by Fenway Park as Harvard Stadium was reported to be under construction. The move represented the first time in 106 years that the rivalry — the second oldest in college football — has been played somewhere other than the stadiums of the two hosts. The contest brought the largest attendance of any game this season to the sold out ballpark for a game with no Ivy League title ramifications, and a challenge simply for the pride of victory. The problem with playing football on a baseball field is that baseball fields aren’t all grass. At least in Fenway Park, where the game was hosted, the facilities staff had to transport sod pallets to cover up the infield dirt. Rolling them out across the original surface, the staff created a football field that spanned from the third base line to the right outfield wall. Still, the new sod didn’t behave much like a grass field. To the casual observer, it looked as though everything was normal, but the first indication of a different playing surface came even before the opening kickoff. As the two teams trotted to their respective locker rooms following their warm-ups, several grounds workers scrambled onto the field to fill up divots and plug the holes already created. The second indication was more of a foreshadowing. On the second play of the contest, Crimson quarterback Tom Stewart took the ball himself four yards up the field. Prior to being tackled, the senior elected to slide. As he went down, his foot stuck in the turf and he rolled forward unnaturally on the four-yard run. About 55-minutes later, Stewart went down of his own accord again. This time he did not get up. As the senior escaped pressure and went to slide as to avoid unnecessary contact, again his foot stuck. This time, a straighter leg caused the injury that left him on the ground. A stretcher was rolled onto the field and Stewart, the senior in his final football game, was rolled away. “Tom wasn’t supposed to play,” Murphy said. In last week’s contest with Penn at Franklin Field, Stewart rolled left before a host of Penn players forced him into the turf hard. The senior was helped off the field by Harvard coaches. Sophomore quarterback Jake Smith spelled the Stewart while the starter was evaluated by medical staff. Stewart, who also serves as the holder for field goals, did not return to the quarterback spot for the remainder of the Penn game but did trot back into play to hold the final PAT for the Crimson. The hold came after the last PAT had failed due to a muffed snap by the holder. In light of his return to action in the final minutes of play, most thought his prior injury must not be serious and he would be good to go for Yale. It turns out that was not the case. Throughout the week of practice leading up to The Game, Stewart didn’t take a single snap. In the Saturday contest, Stewart went 18 of 27 through the air for three touchdowns, one interception, and 312 yards. Place kicker Jake McIntyre has been golden all season and at Fenway Park, he successfully booted an effort from 36-yards out to push Harvard's one-point lead to four. This field goal pushed the McIntyre to tie both the single season record at 13, and the tie the career high made field goals at 30. This season saw McIntyre miss a total of two kicks, counting PATs. The junior made 13 boots for three points and converted on all 31 of his PATs. In addition to his near-perfect record on the field, one of these field goals won the Crimson the game. In the contest against Holy Cross, Harvard trailed by one as the time ticked toward zero. Murphy sent out McIntyre and — after an icing timeout by the visiting Holy Cross — the junior nailed the walk off 25-yarder. Early in the fourth quarter of Saturday’s contest, the Crimson led Yale by one point, but was driving down the field. Senior quarterback Tom Stewart nailed junior wide receiver Jack Cook for a 32-yard gain. Then sophomore wide out Tyler Adams added another 16 to the tally. From the Bulldogs’ 27-yard line, running back Devin Darrington broke through the line right and sprinted down the sideline. The sophomore easily outpaced the entire defense and as he breezed past the final defender, he point out his index finger prior to gliding into the endzone. Immediately, yellow flags dirtied the field. Darrington was called for unsportsmanlike conduct and the touchdown erased. Harvard’s lead dropped from seven to one. 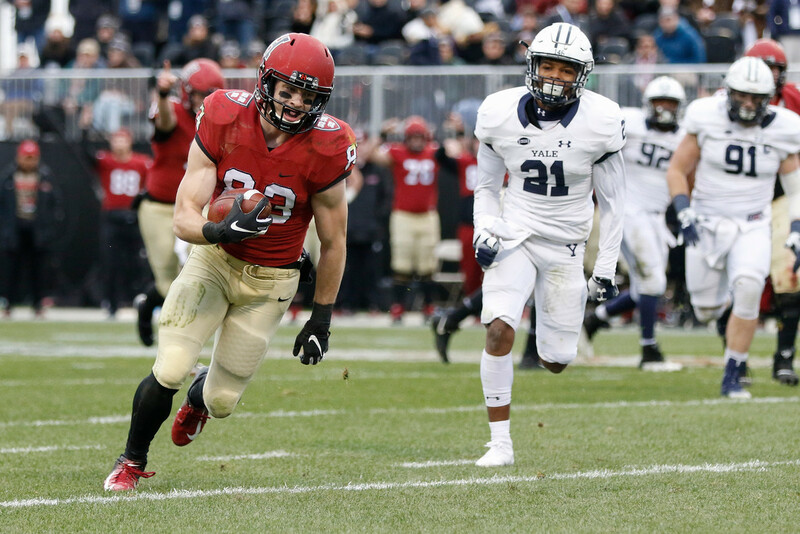 A gif of the play was picked up by Deadspin and posted on twitter with the caption “Harvard touchdown called back after running back flipped Yale’s defense the bird:” The tweet received over 100 retweets and 400 plus favorites. The story was picked up by several other news outlets including Bleacher Report, Fox News, CBS Sports, and others. A photo from The Crimson’s associate multimedia editor Timothy R. O’Meara ‘20, tweeted by the Harvard Crimson Sports twitter account showed clearly that it was in fact, the index finger of Darrington that was being held up. Citing the photo, the news organizations have since issued corrections. The penalty wasn’t the only one major ramifications for the Crimson in the contest. Cornerback Wes Ogsbury was ejected from play after he tackled a Bulldog receiver in a manner that was deemed targeting by the officials. The senior had led Harvard in interceptions this season and was leading the contest in tackles prior to his ejection.